While simply viewing the film Stagecoach by John Ford is plenty to recognize that it is a work worthy of recognition, doing so for the first time in 2014 when I was raised on films like Unforgiven and The Searchers makes it harder to truly appreciate what makes it so special. It reminds me actually of a conversation I had recently with a friend regarding The Matrix, with his wife seeing it for the first time just a few weeks ago and she liked it but was underwhelmed, immediately bringing up other films that she could compare it to from recent years. In 1999 when I saw The Matrix on the big screen, it nearly literally blew my mind. I had never seen anything like it, and I carry that nostalgic power with me which allows that love I feel for it to never diminish. I will always remember it as a film that felt game changing and innovative at the time I was introduced to it, but to someone seeing it for the first time now? It's cool, but not as cool as (insert title here). Released in 1939, Stagecoach was a game changing work that revolutionized the western genre, which at the time was considered to be B level when it was at its best. It continues to be admired today and in 1995 it was deemed to be "historically significant" by the United States Library of Congress and selected for preservation in the National Film Registry. 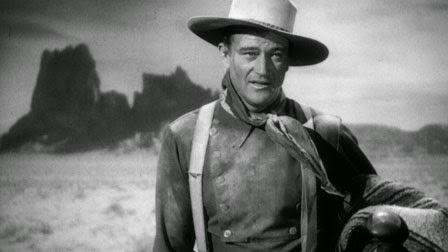 The plot revolves around a group of strangers riding a stagecoach through Apache territory, and along the way they encounter a character known as the Ringo Kid, played by the legendary John Wayne and this would absolutely prove to be his breakthrough performance that would pave the way for the remainder of his career. Seriously, if you haven't seen Stagecoach yet, even if you don't care for John Wayne, even if you don't care for the western genre as a whole, you need to admire the brilliance of the way they pull off Wayne's entrance into this film. It is beyond epic. Overall, I admire Stagecoach for being the wonderfully made film that it is and for keeping me entertained throughout every moment of its running time, but I can't say I was bowled over by the experience and felt I was watching a landmark of cinema. It's worth it to note that I have never been bowled over by a western on my first viewing. Perhaps it is just a genre that takes time for me to warm up to. Next time around, I may be singing a slightly sweeter tune in regards to Stagecoach, but for now simply knowing it is a great film is good enough for me. John Ford's The Searchers was my first real introduction to Westerns during a film class in college. I wouldn't have appreciated it as much without my teacher explaining all of the nuance to me. But ever since, I have enjoyed the Western genre. My favorite modern Western is actually Joss Whedon's Firefly TV show. For some reason when I was young I associated the word western with boring, until I saw Clint Eastwood's Unforgiven and The Searchers. Proved me wrong. This reads like a 3, not a 4. It's ok to give The Duke a 3. I debated the score, but I wouldn't go lower than 3.5...it is extremely well made and all, but for most people it is a without a doubt 5/5 masterpiece top 100 film of all time type of work...didn't quite get there with me.